Are you headed to the Business Expo tomorrow? We’re excited to be taking part in the Melville Chamber of Commerce’s annual event at the Melville Marriott. The President of Crackerjack Promos, Steve Oil, will be on-hand at the Expo to help you explore targeted, creative and cost-effective promotional products that will build your brand recognition. 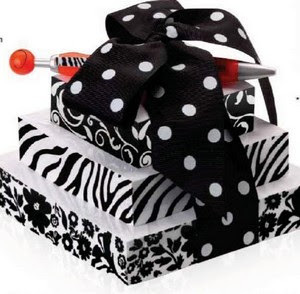 This stylish note cube pyramid comes with three stock designs wrapped in a 1-1/2” black ribbon. There are three cubes (3”x3”, 4”x4” and 5”x5”), each individually shrink-wrapped and each has 250 sheets. Imprint on swanky pen included. This sleek and modern cylinder-shaped flashlight will certainly put a spotlight on your company’s message! Four beautiful LED focused directional colors with 24 LED ultra-bright flood lights are powered by 4 AAA batteries, which are included. Includes a wrist lanyard and gift box. Perfect for corporate gift giving! Ever been in a tight space and needed a light? 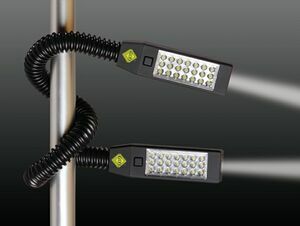 This LED Flex Light wraps securely anywhere, providing light in any hard to reach place! There are 6 LED directional lights as well as 21 LED ultra bright flood lights on each head. There is free admission into the exhibit hall, so make sure to come say hello to Steve and see one of the many product options we will have on display. The Business Expo takes place from 9am-4pm on Wednesday, October 24, 2012. For directions, click here. If you can’t make it to the business expo and need help in choosing promotional products for your company, please contact Crackerjack Promos at 1-800-704-7155, or view us online. Since 1980, Crackerjack Promos, Long Island, NY, has helped companies build their brand recognition with thousands of targeted, creative and cost-effective promotional products, such as calendars, towels, shirts, hats, jackets, pens, cups, mugs, lapel pins, computer-related, key chains, food items, candy, trophies, plaques, awards, watches and much, much more. We Imprint Minds! We’ve Been Nominated for Best of Long Island! OCTOBER SPECIAL: Select 2013 Imprinted Calendars!